Last updated on May 20, 2014 November 11, 2015 by Daniel Waldron for Armagard Ltd.
1. Complete Control of Your Advertising – No time restraints, no dependency on advertising agencies or print media. 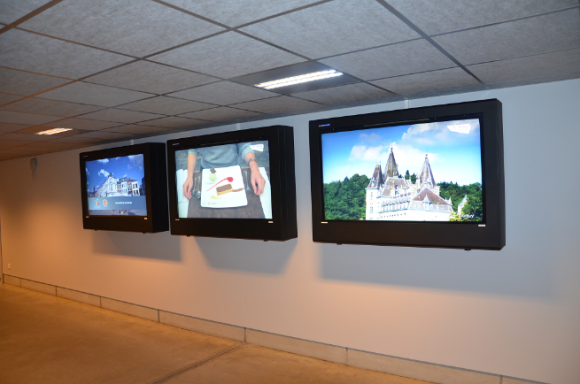 Digital signage displays allow you to update screen content at your convenience, anytime and almost instantly. 2. Creates a Lasting First Impression – Digital signage displays look impressive. Digital media signage is alluring and engages audiences, leaving a lasting impression, especially when advertising promotions, information or news. Digital Signage Displays Provide a Glamour That’s Unmatched by other Advertising Platforms. Which would you choose? 3. Your Competitors are Using Digital Signage – You must have it too! Don’t fall behind in the battle for audience attention. Stay current, stay competitive or get ahead of your business rivals. 4. Digital Signage Displays Make You Money – Increase brand awareness, lead generation and benefit from improved sales and revenue all thanks to digital signage advertising. Not using your display? Rent it out to other advertisers and continue to generate revenue. 5. Digital Signage Displays Cut Advertising Costs – Eliminate expensive print or web advertising campaigns. Invest in digital signage displays and benefit from a permanent advertising unit that’s your own. Use the money that you save to invest in top-class content for your display. Or better still, buy another digital signage display and make more money. 6. Digital Signage Provides an Entertainment Factor – Customers queuing on your business premises? When all your personnel are busy, digital media displays hold attention whilst customers await service. Digital signage effectively acts as an additional customer service representative. 7. Display What You Like – Digital signage allows you to display information purely focused on your brand and your business. Your content is not surrounded by hoards of other advertising messages. 8. Display Unlimited Amounts of Content – Upload photographs, adverts and even your social media feeds at your convenience, all at the same time. The possibilities are endless. 10. All-Year-Round Advertising – Uninterrupted advertising all-year-round. Adapt your content for seasonal promotions and keep your business brand in the public eye 365 days a year with minimum hassle. Armagard is an award-winning company that designs, manufactures and supplies a wide variety of digital signage advertising systems that offer great value for money. View our digital signage range here and choose from various solutions to boost the prominence of your business. Choose from a selection of new and classic design concepts to suit indoor and outdoor environments. Digital signage solutions from our extensive range have been installed in locations all over the world, serving a variety of purposes. Discover the best digital signage solution for your business by completing an online ‘Quick Enquiry’ form, via our website – www.armagard.com – we’ll provide you with a FREE suitability assessment for your desired installation location. Prefer a chat? Call Armagard on 0121 608 7226. This entry is filed under digital advertising, digital signage, digital signage enclosure, digital signage networks, outdoor advertising, outdoor digital signage. You can follow any responses to this entry through the RSS 2.0 feed. Both comments and pings are currently closed.